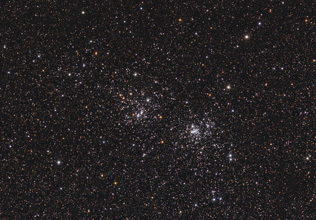 These two star clusters are very famous objects among visual astronomers and astrphotographers. Even under moderately dark skies, the double cluster in the constellation of Perseus is easily seen with the naked eye. Astronomers number its age to a few million years, i.e. 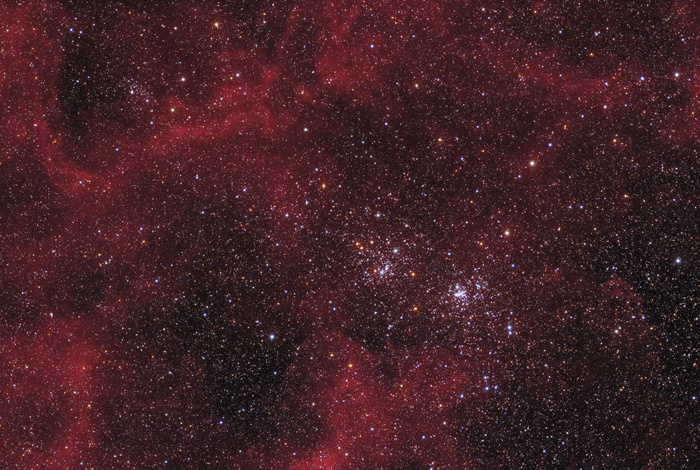 a relatively young cluster. The absolute separation between NGC869 and NGC884 is only a few 100 lightyears while their light travels for about 7600 years until it reaches the Earth. About 4 degrees further North, you will find the area of the Heart and Soul Nebula (IC1805/IC1848), an extended region of strong Ha emission and also a popular target for astrophotographers. Due to the small angluar distance between those nebulas and the double cluster, I was wondering if there is any faint Ha emission in the background of NGC869 and NGC884, or at least in the close neighborhood. A single 20min exposure through a 7nm Halpha filter was not very promising. However, after integrating and heavily stretching about 3 hours of Halpha data, some parts of the nebula started to get visible. The resulting image using 22 hours of Halpha data is shown if you click on the thumbnail just to the right. 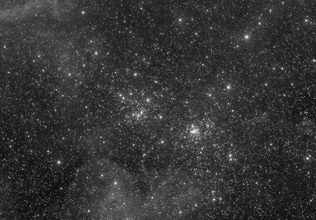 Additional Luminance and RGB images (4.3 hours in total) were taken for a color image of this rich star field (image on the far right). The image on the top then shows the result of combining the narrowband and the LRGB color image. The Halpha line was integrated so that the luminance and the red channel were enhanced.